We bought our first motorhome in May 2017. Since then, we've explored 17 countries across Europe, travelled over 30,000 miles in two different vans and made many, (MANY) mistakes. My goodness, motorhome life has been a learning curve! Time has gone so fast, and yet we've managed to do so much. So, we sat down with a glass (fine, ok, a bottle) of wine and decided to share our best lessons and tips to help you have the best adventures in your motorhome or campervan. Campervan tip 7- you are lazier than you think you are. Do you have any vanlife tips? If we could go back, we would rent a van for a week first, or even just a weekend. Admittedly, this would have taken a chunk of money out of our kitty, but I think we would have had a better idea right from the start about what worked for us and what didn't. Our first motorhome had a (small double!) rear end bunk bed and an overcab bed for Jade. She hated the overcab bit as she couldn't sit up in it, and we didn't like sleeping in a bunk bed. Also, the only seating area was the dinette. One tiny table area. For three people. For two weeks. It didn't work well. Jade spent most of her time during the day on OUR bed (where she could sit up) and we had the table. Poor Mr WB usually worked in the cab when he needed to spread his things out. I believe renting would have highlighted some of these issues and saved us having to change our motorhome so quickly. The point is- don't try and replicate your home life in a van. It won't work and you'll never find a layout which works for you as you'll be looking for too many things you don't need. Ok, confession time. In our first motorhome, we carried four warm, snuggly blankets with us. FOUR. There are only three of us onboard!! At various times over the past year, we have also carried a juicer, blender, hand whisk and cake tins. None of which we have used. There's also an iron and fold up ironing board in here somewhere. Pretty sure it's still in the box. I'm not saying YOU shouldn't carry all these things. If you juice every day or bake cakes once a week- AMAZING (and can you come travel with me?!?!) but we don't do those things. So we shouldn't be carrying those things. In my dreams, vanlife would make me… better. I'd wake up earlier, do yoga and meditate for an hour, go for a run, eat carrots for breakfast and feel ‘inner peace'. In a week I'd be stick thin, with blonde beachy waves (no idea where the blonde came from!!) and I'd be able to prance around in a bikini without holding anything in. SPOILER- it didn't work like that. I do actually wake up early, (which is when I'm writing this!) I have exercised a couple of times (in a year!) but mostly I feel like a complete idiot when I do. My exercise of choice is HIIT- which is 20/30 minutes of High-Intensity Interval training. I love it- mainly because it's over so quickly- but I feel so self-conscious doing it outside where people can SEE. I try to ignore the twitching curtains and people walking their dogs, but it's hard. So I use every excuse not to do it. I have never, EVER eaten carrots for breakfast- why would I when there are pain chocolat to be had?? Or croissants? Or warm crusty bread? And I have moments when I feel at peace- but then I wake up. Vanlife doesn't change YOU or the people you travel with. No matter how much you want it to. If you're looking for ways to stay fit on the road, these tips will help. Seriously. Don't go TOO big. Yep, I said it. We could have bought a bigger motorhome (ours is currently 7.5m, which is fairly well-sized). Any bigger makes it difficult to park in loads of places, both free and paid across Europe. We struggle occasionally with our trailer and there are some spots we just cannot fit into, so we have to move on or park in coach parking, where we generally get told off! If we had a bigger motorhome, this would be even harder. Also, think about height. If you are above 3m, you are classed as a CAT 4 vehicle on toll roads in Europe, which more than doubles the price you pay on some motorways. Our first van was 3.2m (that pesky overcab bed) and we didn't even realise what that would mean. Our first European trip cost us over £200 in toll fees alone- for a two-week trip!! Vanlife tips- make the most of every beautiful location. Oh, wild camping. How you used to terrify me. Our very first trip away was to South Wales (which is amazing. If you haven't been- go!) and the subject of wild camping came up. To be honest, I didn't even really know what it was– I just knew it SCARED me. I honestly thought we'd be breaking the law and get arrested. Or murdered. I didn't know how to find places to stop at- and what if it was all full when we arrived? Where would we stay then? We'd have to drive around ALL NIGHT and then we'd crash and DIE. Nope, I'm not dramatic at all. If the idea of being self-sufficient and paying very little for your overnight stops appeals to you, then please please believe me when I say that IT'S OK. Our first trip where we wild camped was Scotland. The first night was hard and we didn't sleep well. I panicked and worried and woke up to every little sound- and that's after we spent ages worrying about where to find somewhere. The second night was easier. By the end of the first week it wasn't even an issue anymore. In fact, when we stopped at a campsite for a few nights so we could safely leave the van whilst we rode the bikes, I resented the £27/night fee. That's how quick it was to adapt. Since then, we've travelled the rest of the UK (including Cornwall), and wild camped in France, Germany, Austria, Switzerland, Luxembourg, Belgium, Italy, and even found things to do in Liechtenstein! We class aires as ‘wild camping' as you don't book in advance and you don't pay very much for them, but we have also found places where we've stayed for free. It really can be done. By their very nature, vans have a lot of storage under the seats. Some of this stuff is pretty easy to get to and some of it is a pain in the backside. Be flexible with your storage- we found that how we first arranged our cupboards wasn't great so we rearranged them to a better solution. But we've also discovered that if something isn't easily reached, such as our spare plates or bowls for guests, we just won't bother to get it out. We keep 3 large plates and 3 pasta bowls, as well as small plates and cereal bowls in an easy access locker for daily use. The rest are stored at the back of the van in a really annoying nook. We've found that, if we have guests, we just serve dinner in a pasta bowl instead of bothering to dig under the seat for an extra plate. The exception to this is wine, which is stored securely in a cupboard as far from the heater as we can, so that it stays cool. Funnily enough, we are always motivated to move the seat cushions and dig a bottle out. Because we tow an unbraked motorbike trailer, there's a lot of extra pressure put on to the motorhome, especially when we're travelling down a steep mountain. Like in Switzerland. We didn't fully appreciate how much extra force it was until we pulled into a car park and our brakes were on fire. Literally- there was smoke. Even two hours later, there was still smoke. We probably should have called our breakdown assistance at that point, but we decided to head for the local garage- which was at the bottom of the mountain. As we set off, we realised our brakes were completely useless and we only had the handbrake to slow us down! It was the most scared I've ever been in the van. We did make it to the bottom safely, and got to the garage who replaced our brakes, but it was a sobering lesson. What we should have done was stopped more often, used engine braking (low gears) and not ‘ridden' our brakes all the way down. What we do now is stay in or around second gear, let the revs creep up to 2000RPM, then brake down to 1000RPM (ish), then come off brakes and let it roll again. This allows the brakes to cool between each ‘pulse'. There are lots of ways to do this and if you search enough forums you'll find many heated opinions on the best way to bring a motorhome down a mountain, but we've just transversed Germany, Switzerland and Austria with an unbraked trailer without any problems or burning brakes using this method, so it works for us. Please, before you travel, make sure your vehicle is safe. Essential tips for motorhome life- learn how to drive in mountains! Folding sofa/ double chair. This is BRILLIANT- you can put your feet up and read a book in comfort, or two adults can sit and share dinner and a glass of wine. We carry this and several folding chairs and it collapses to about the same size as the other chairs. One of my favourite things we've bought and we use it pretty much at every place we stop. While we're talking about outside things, our collapsible BBQ is also really useful. Many places allow BBQs, but not open fires on the ground. With this, we can have a fire, but it's kept off the ground. We bought a metal plate from B & Q (UK hardware shop) which sits underneath and catches any stray sparks. Leave it overnight and it's cool in the morning to empty out (somewhere safe) and pack away. We carry some fire logs and if possible we'll use any wood/ twigs we find lying around in a wild camping spot. Indoors, we LOVE our Le Creuset kettle. It's a little pricey, but we honestly believe the quality is worth it. A solid base allows for quick boiling, it whistles (which I thought I'd hate but actually is so useful when you're sitting outside) and it has happily survived a year of travelling in our sink (make sure it's cool first.) Definitely worth the investment. We also love our sat-nav. This has taken us all over Europe with rarely an issue. Definitely a useful bit of kit. So there we have it- the top 10 tips we've learnt from motorhome living. Over to you. What are your favourite lessons from vanlife? Which of these resonate with you most? Let me know in the comments below so we can all share. Enjoyed this post? We'd love it if you shared it on social media. Thank you. Great post Kat 🙂 I think my biggest mistake was buying a vehicle that was 1) very old and 2) simply not well used. It had been neglected by previous owners and within just a couple of months of full time living in it I’ve had SO many things go wrong and break – roof vents, the fridge, water pump, taps, blinds. I dread to think what else could go wrong! I’m already planning my second vehicle! Hey! So sorry that I missed this comment! We did exactly the same thing with our first vehicle- bought an older model, but it had a lot of faults. It’s all a learning curve isn’t it?! Hope you managed to fix all the issues! Strange- there should be an image under that sentence- can you see nothing there at all? It seems to be working fine for me and others who have pinned it so not sure why it’s not working! Thanks Vincent. Glad you enjoyed it. 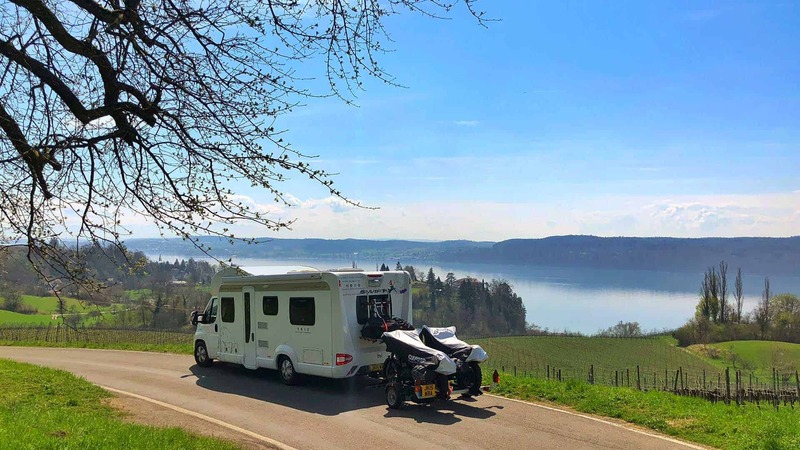 This is a great post – we’re going to start touring Europe soon ourselves – though in a fifth wheel camper – and we’ll be taking some of your lessons on board! Shame about Lesson 4 though! I’d love to take a year and travel and live in a motor home. I’m not sure my husband will ever jump on board the idea. I think the first 30 days of dealing with less “stuff” would be the toughest part for me. Thanks for sharing! So much to see, so little time. Great post thanks. We are just coming up to our 12 months anniversary around Italy, Croatia, Greece, Turkey, Crete, Sicily and now in France and are loving the nomadic life. We almost exclusively wildcamp and have had no problems doing this so far. Our biggest mistake was leaving the awning up overnight when rain was forecast without having it on a slope or the middle roof support strut installed. The result was a BANG about 2.00am as the weight of water on the roof smashed one of the awning arms. Luckily we were just 20km from the only Fiamma dealer in Croatia who had the part and a number for someone to fit it. Lesson – wind down your awning or set it out properly and with tie downs in case of unexpected high winds. If bad weather is expected then wind it in. We hope to catch up with you sometime as we are planning on doing this for several years to come. Hi Alan- fantastic!! I’m so looking forward to travelling around Croatia and Greece next year (fingers crossed!) Funnily enough we had a similar problem with our awning- we left it out overnight and the wind blew it up over the roof!! Oops!!!! Luckily no damage- we just looked stupid 🙂 Would be awesome to see you guys on the road somewhere. A real inspiration for me. Would be awesome to see you guys on the road somewhere. Thank you for sharing your adventure. Hi Kat. You certainly know how to sell the dream. We have had our vdub four years now and travel down to Spain every year. Looking forward to turning left out of the tunnel in 2019 for a change. Only 4 months of work left and then no need to book return dates. Fantastic read, keep it up. ps, Andalucia is well worth a visit. Keep inland though. So much history. Lucky you!! You’re going to have so many amazing adventures!! 4 months will fly by! Thanks for the tip re Andalucia- I’ll add it to our (never-ending!) list! I bought my first Van (T5) last year. When I’m out in it I love it….. but I also feel very guilty when it just sits there (“take it out more then I hear you cry”), problem is with Kids Clubs it’s not always that easy. I’m also not mechanically minded which concerns me. We bought the Van off a guy who cleared loved it to pieces and I’d hate to think I let it degrade through lack of use or lack of care. All the trips I’ve done I’ve adored, the North Coast 500 was simply stunning and possibly one of the most fun holidays I’ve ever had…. all trapped 24/7 inside a tin can with my 18 stone Fireman brother in law. Let’s see what 2019 brings. Love the website keep up the good work. Currently working out where to go with my 12 y/o Son early Jan for a night. It will be his first night out in it….any tips? Amazing!! What an adventure for you and your son! Not sure where you’re based, but I’ll assume early January will be cold! I’d suggest somewhere which allows fires (always fun for a kid) or somewhere you can plug into the heating so he doesn’t hate the van for the future! Many van users aren’t mechanically minded- take it to a garage just as you owuld a car. Don’t let that stop you enjoying your new purchase. Good luck for 2019! wonderful. amazing article. here i w’ll say thanks for guideline because i was planing for long road adventure trip in next week. thank you so much. i really take some tips which will be helpful for me. We was only 7.04 before but had a easy lifter bike trailer on the back which made us longer than this new one MH, which we can put the bike and cycles in the garage. Couldn’t take the push bikes before. Also with the trailer we didn’t have any overhang so like you had to move on at times which wasn’t a problem. It will be interesting for us to see how we fair now when we return to Europe. Ooooh- sounds like fun in your new motorhome! Happy travels! We’ve got an old van, but it’s been well looked after. We’ve also augmented it with solar panel, inverter and numerous other bits and bobs. I’m sure we’ll get rid of some of the stuff we’ve got, but we have collapsible pans and kettle which are brilliant space savers. Our biggest problem is clothes! Love this post. I cannot recommend enough hiring before buying. We actually did this in NZ before we came back to the UK to buy our first van. Many years later we actually ran a hire company for a few years and had lots of renters who were try before they buy. Awesome! that is very nice and help full article. Especially for me because i was planning for trip with my friends. So thank keep posting such type of post. I really love it.